Recognizing the potential for ‘big data’ as “an untapped resource of evidence that may be used to inform policy and decision making”, the National Collaborating Centre for Infectious Disease commissioned a background document to initiate discussion among Canadian public health professionals. The primary objective was to examine the potential for big data to inform public health policy for infectious disease management in Canada. 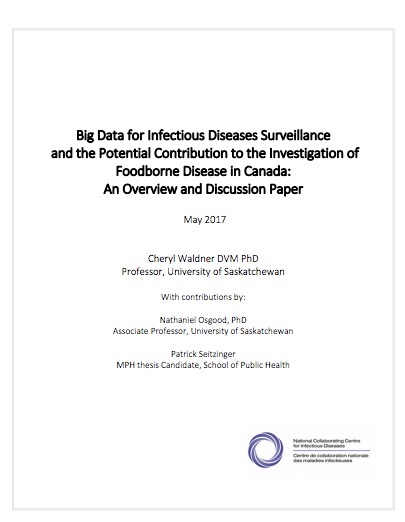 On May 17, 2017, Dr. Cheryl Waldner, DVM, PhD (University of Saskatchewan) presented a related webinar, giving an overview of big data, its opportunities and limitations for public health, and describing examples related to foodborne illnesses. Click here to request an archived version of the related webinar What can Big Data do for Public Health?